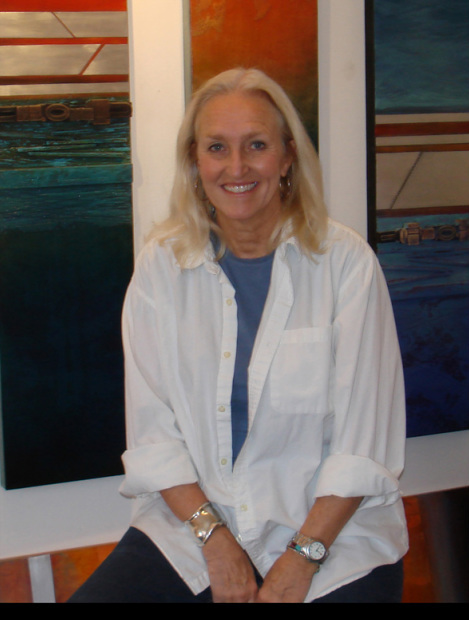 Her mixed media work is mostly non-objective or abstract, on wood panels or on collaged paper. Primarily using oil glazes with pure mineral pigments over marble dust mixtures. Surfaces are sanded and built up in numerous, very translucent, layers to create intense colors with great depth. Sanded metal is included on most wood panels. Using wood panels allows for any size work, and commissions are welcome. ​Her figurative works are primarily drawings of nudes or plants, collaged with mixed media. She was born in Sweden and moved to the United States in 1976. "Whether my work is non-objective, abstract or figurative, there is always a search for something that signifies a subtle inner beauty, depth and simplicity even when the forms are complex. I am intrigued by the tension between forms, lines and colors that ultimately can resolve in harmony. Sometimes, this is achieved with more obvious forms, and sometimes, with a delicate balance using colors and textures to give substance to the spaces that exist because there are no objects." "If my work can slow someone down to contemplate something within her or himself - if the work can add a moment of focus on their inner peace in this absurd world - then I have reached the viewer. We, the viewer and the mark maker, would be connected through that ephemeral magic that is all around, as I am convinced that one's range of intellect is so trivial in the face of greater mysteries." Jan S Peters, Professor Emerita, Art History & Visual Studies, University of Kentucky, USA says "Steene's luminous layers of colors and intuitively balanced structure are reminiscent of Rothko's luminous paintings. Her visual subtleties slow down the viewing process and contribute to an overall sense of harmony and inner peace, one that serves as an antidote to today's fast-paced, chaotic world". Peter Abbs, Emeritus Professor of Creative Writing, University of Sussex, Great Britain says "Call Steene's paintings the fusion of geometry and grace, which probes and pierces, or let us say we gaze out from the eye of light itself".